The traffic engineering trial along Jalan Mampang Prapatan Raya, South Jakarta had to be stopped. Traffic through the intersections in the region has returned to normal.
" 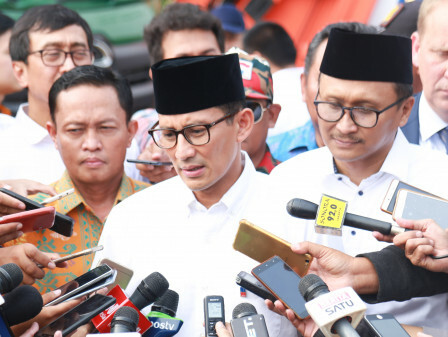 I want socialization about traffic engineering trial to be more maximized first"
Jakarta Deputy Governor, Sandiaga Uno expressed he instructed Transportation Dept. to stop its trial. "I want socialization about traffic engineering trial to be more maximized first," he told, Sunday (5/20). He explained, it is conducted to maximize traffic flow in aftermath of Mampang Underpass operational. "We want to parse traffic jam in the area," he told. Separately, Jakarta Transportation Dept. Vice Head, Sigit Widjatmoko stated it is only temporary and will be evaluated by taking into account the aspirations of the people. "Three intersections closure is done based on analysis and study. Surely, we will make more intense communication with the people," he stated. As reported earlier, there were three closed intersections, namely Jalan Mampang Prapatan Raya, Jalan Duren Tiga Selatan and Jalan Duren Bangka. It is targeted can be smoother, as traffic light is reduced. It's mainly for vehicles from the north (Jalan HR Rasuna Said-Ragunan) or vice versa.